Not a lot of people have heard of Quest Nutrition, but there certainly is no shortage of people that know what Quest Bars are. There are multiple reasons why Quest Bars are so popular, and this review will take an in depth look into why these are some of the world’s most popular bars. High protein bar with high fibre, low carb, and less stomach upsets. Impressive list of ingredients, mostly natural. Fantastic taste with a range of interesting and gourmet flavours. Whey protein isolate (WPI) and milk protein isolate making up the protein blend – these are two very high quality proteins. Noticeably absent are cheaper protein sources. Isomalto-oligosaccharide – a prebiotic fibre that is well known for its benefits as a low GI carbohydrate, promotes digestive health, while also being less likely to cause stomach upsets. Each 60 g bar contains 200 calories, 20 g protein, 22 g carbohydrates (of which 18 g is actually dietary fibre), 1 g sugar, and 9 g fat (of which only 0.5 g is saturated). Quest Bar has so many feathers under its cap, it’s difficult to know where to start. Firstly, there are really only 4 g of non-fibre carbohydrates (ie. carbs that actually provide calories), so low carb dieters can happily munch away on these without the fear that it will ruin their diet. The manufacturers have gone out of their way to ensure the bars are as natural as possible, and they even make an all-natural range. However, what is most impressive is the choice of proteins. Both whey protein isolate and milk protein isolate are very high quality sources of protein that bar makers often avoid due to their physical properties and cost. However, Quest not only have used these, but they have used them more than successfully. The use of isomalto-oligosaccharide is also an applauded decision. Users of high fibre protein bars will often be familiar with the flatulence and gastric issues that may arrise. This is not an issue with Quest Bars. The bars are also gluten-free, so you won’t be missing out on anything even if you suffer from Celiac disease. Finally, despite all this, Quest bars are actually reasonably priced, holding no price premium over competing bars. 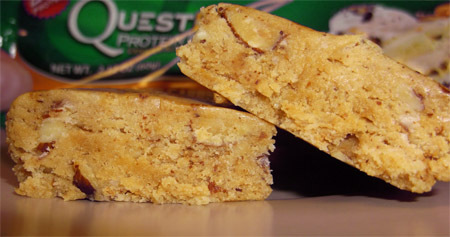 As a dietary supplement, Quest Bars are very effective for use during weight loss periods. Not only are they rich in high quality proteins, but they are also high in an excellent source of dietary fibre that is both easy on the gut and does a good job of keeping you full without too many calories. As a product Quest Bars are extremely hard to fault. However, they are not really for everyone. The ingredients used clearly have a weight loss or maintenance focus, so if you’re trying to bulk up or to gain some weight, the 200 calories and 20 g protein isn’t going to do much for you. The bulky and filling high fibre content probably would also do you no favours when you’re trying to shovel in as many calories as possible. So if you want a bar for some serious bulking, it’s probably best to find something else. If you looked at the ingredient list and nutrition panel, you would be forgiven for thinking that Quest Bars would taste like absolute rubbish. However, this couldn’t be further from the truth. Quest Bars are actually remarkably tasty. They have a soft chewy texture with a tinge of saltiness. The flavour is rich without being too sweet. Overall, it’s a nice and balanced profile that makes eating it a joy. Regardless of what you prefer, Quest has you well covered because these bars are available in a huge number of gourmet flavours, a dozen to be precise. These range from chocolate brownie to lemon cream pie to name a few. Each has its own distinctive taste, and going through them was a privilege. If you are looking for a low carb protein bar that is natural and delicious, it is hard to overlook Quest Bars, which are definitely the pick of the bunch. Just don’t get fooled by the supposedly high looking carb content, because only 4 g of these are true carbohydrates. Well priced and available in so many delicious flavours, the only problem you’ll find with these bars is fighting the crowds of people snatching up your favourite varieties.